The Old Bond Store is a bromoil print which was created through an intervention in the photographic process. A gelatin silver photograph is bleached and fixed, then soaked in water. A greasy ink is then applied and gradually built up to the required density 2. Cazneaux, like other pictorialists, applied sepia inks to his work during this fiddly process in order to make the light and dark within his photographs more dynamic. He took many pictures around The Rocks when first arriving in Sydney, because the exteriors of the old buildings were luminous after being disinfected in the wake of a Plague outbreak during the first years of the twentieth century 3. This resulted in the facades of the terraces and wharf industries exuding a gleam not found elsewhere in Sydney. 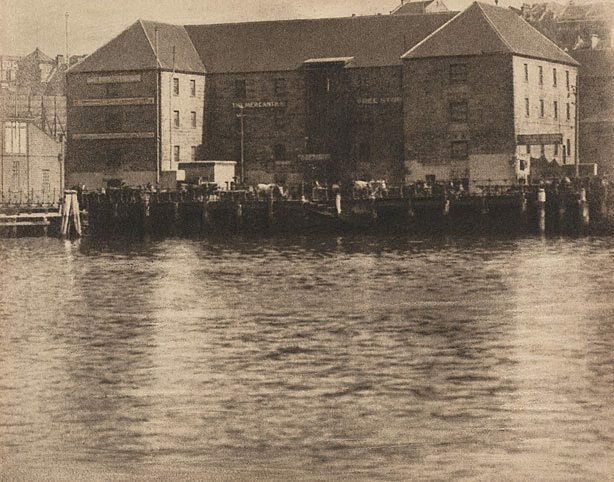 The image, although entitled The Old Bond Store, positions the object of the picture in the background placing significance on the Quay waterway and how the sunlight dances on its surface. The Photographic Society of New South Wales organised an exhibition of Cazneaux’s photographs in 1909, the first such solo exhibition of its kind in Australia. In 1916 he and fellow pictorialist photographer, Cecil Bostock founded the Sydney Camera Circle. The group was particularly interested in the how pictorialism could be adapted to and extended within an Australian context. The mechanised, standardised and frenetic pace of Freeman’s increasingly took its toll on Cazneaux’s creativity and health, and he resigned in 1917. He moved with his wife and daughters to the Sydney suburb of Roseville, and in 1920 he was employed as the official photographer for The Home magazine. This new position let him work in a varied indoor and outdoor environments. In 1938 Cazneaux was awarded an Honorary Fellow of the Royal Photographic Society of London. He continued to work until his death in 1953. Australia beautiful: the home pictorial annual , Sydney, 1928, (illus. ).